Who Do You Trust More: Apple, Microsoft, or Google? By now you’ve probably seen Microsoft’s Scroogled TV commercial dissing the Chromebook. If you’re a Mac user, you’re probably amused that monopolist Microsoft is getting so upset at free-for-all “do no evil” Google. The ad makes the point that a Chromebook isn’t a “real” computer because it doesn’t run Windows or Microsoft Office. I find that kind of offensive, since my Macs don’t run Windows. Even with Office available for them, I guess Microsoft doesn’t consider my Macs “real” computers either – not to mention Linux machines. That’s a pretty narrow definition of a computer, excluding anything released before Office for Windows first shipped in 1990, nine years after the first IBM PC debuted. Anyhow, the Chromebook doesn’t run Windows software, and it’s pretty much dependent on a WiFi connection, so it’s not worth much (if anything) at the pawn shop. That said, why would anyone want to sell a Chromebook to a pawn shop? With Craigslist and eBay, there are better ways to sell your aging tech. Microsoft is the oldest of these three companies, founded in 1975 to sell a BASIC interpreter developed by Bill Gates and Paul Allen. Microsoft developed a habit of taking other people’s products – whether BASIC, CP/M, the Mac GUI, Visicalc, Netscape, or iOS – and building its own competing version, often without any acknowledgement or licensing of the original product. Further, Microsoft has been convicted of monopolistic practices, such as making Windows 3.1 report it was incompatible with DR-DOS, an MS-DOS competitor, even though that was not the case. Also for making Internet Explorer the default Windows browser and telling users it could not be removed without damaging Windows’ functionality. Microsoft has a long history of taking care of its customers. For instance, Windows XP has been around since 2001, has not been updated since 2008, and although mainstream support expired in 2009, it still receives extended support until April 2014. Apple was founded one year after Microsoft to sell the original Apple computer. It helped establish home computing in the mid-to-late 1970s, and its Lisa and Macintosh computer lines made the graphical user interface (GUI) the norm. Easy networking and shared laser printers were early Apple innovations, and its Newton MessagePad practically created the PDA (personal digital assistant) category. Apple’s PowerBook notebook line created the basic form factor used by almost every laptop since, and although Apple nearly went under circa 1996, it has come back to become the world’s most valuable company, a distinction it first earned in 2011. Its iPod redefined the world of digital music players. Its iPhone completely changed the direction of the smartphone market. And its iPad is the most successful tablet line in the world. OS X 10.5 Leopard left behind every G3 Mac that could run Tiger and did not support installation on G4 Macs below 867 MHz, although people found workarounds for that. MobileMe replaced .mac, making it impossible to sync data between Macs running Tiger and Leopard via Apple services. OS X 10.6 Snow Leopard left behind every PowerPC Mac that had run Leopard. It was the last version of OS X to support use of older PowerPC-only software via Rosetta. Like Leopard, it supports MobileMe. OS X 10.7 Lion left behind all PowerPC-only software and replaced MobileMe with iCloud, making it impossible to sync with Macs running OS X 10.6 or earlier using Apple services. It also dropped support for Macs built around Intel Core Solo and Core Duo CPUs. OS X 10.8 Mountain Lion left behind a lot of early Core 2 Duo Macs, mostly because of inadequate graphics processors. Thankfully, OS X 10.9 Mavericks runs on all the same Macs as Mountain Lion, and it continues to support iCloud. As someone who uses OS X 10.4, 10.5, 10.6, and 10.9, I have been very frustrated with Apple changing its online services and the incompatibilities that entails. My solution has been to use Google for my calendar and address book, since it services are compatible with all of these operating systems. Google was founded in 1998 as a search engine company, and it has expanded significantly from those humble beginnings. It soon came to dominate web searches (about 80% of the market at present), and it leveraged that technology to sell ads with its search results. Its Gmail service, launched in 2004, has become one of the leading free email providers on the planet. In 2010, Google Docs was introduced as an online alternative to Microsoft Office, and it’s very easy to share its documents with others on the Web. Speaking of the Web, Google’s Chrome browser, introduced in 2008, has come to dominate the industry. Lots of Windows users choose it over Internet Explorer and Firefox, and many Mac users choose it over Safari and Firefox. Like Microsoft and Apple, Google is also an operating system company. Its Android platform competes directly with Windows Phone and iOS, and it has become the predominant smartphone and tablet operating system. As mentioned above, Google also has a Chrome operating system use in Chromebooks, which compete with both laptops and tablets to some extent, although Chrome OS is little more than a browser window to the Internet. Google has also branched out into social media, although its Google+ pales in the face of Facebook and Twitter. All three companies have their own browsers and operating systems. All offer a free email/address book/calendar sync service. But where Microsoft primarily courts Windows users and Apple mostly targets Mac and iOS users, Google does its best to remain platform agnostic. You can access Gmail using OS X Mail, Microsoft Outlook, a web browser, or any standard email client. Internet Explorer is Windows only, Safari is now Mac only, but Chrome supports Windows, OS X, iOS, Linux, and Android. Microsoft Office is available on Windows and OS X, while Google Docs works on anything with a browser. Each company has its own agenda. Apple wants to lock you into the iOS and/or Macintosh platform. Microsoft wants you to be a Windows user. Google wants your eyes, which allows it to provide so many free services based on ad revenues. As a Mac and iOS user, I wish I could recommend Apple more highly, but I have been burned too many times by the change from .mac to MobileMe to iCloud to believe that Apple won’t leave its users high and dry again. Apple left its AppleWorks users out in the cold long ago, and its current version of iWork no longer imports .cwk files. None of my old PowerPC software – including AppleWorks and Microsoft Office 2004 – runs on OS X 10.7 or later. Fortunately, Apple began integrating some Microsoft services into OS X starting with 10.3 Panther, and that has come full circle, so it should be possible to sync my address book and calendar to some Microsoft service. But as a matter of principle, I’d rather not. I don’t like the way Microsoft has thrown around its weight over the years. Google appears to be the best choice among these three, and it allows me to set up Linux and Android equipment as well. That said, they don’t “do no evil”. They have cooperated with the Great Firewall of China. They have cooperated with the NSA, but so have all the telephone companies. As a longtime Gmail user, I find it easiest to integrate my email, calendar, and address book with Google’s services. Google Docs is okay, iWork for OS X 10.9 is free (but feature incomplete), and I have a boatload of AppleWorks spreadsheets, as well as some word processing documents. Rather than stick with AppleWorks on my old Macs and have no access to files on my MacBook running OS X 10.9 Mavericks, I have been exporting my .cwk spreadsheets to Excel 98, 2001 Format. And then, because I can’t run my copy of Office on Mavericks either, I open those spreadsheets in LibreOffice, a free, open source Microsoft Office alternative that I’m becoming pretty comfortable with. I then save in .ods (open document spreadsheet) format. I haven’t really used Excel since version 2.2 or 3.0. I’ve been using AppleWorks since it first came out as ClarisWorks in the System 7 era. That said, I’m not having any issues adjusting to LibreOffice spreadsheets. In fact, it has one advantage over AppleWorks: When creating a chart, LibreOffice anti-aliases the lines for a much smoother look where AppleWorks doesn’t do that at all. It can also smooth lines into curves, a feature AppleWorks never offered. I use three free email services: Yahoo!, which I’ve had forever. Apple’s name-changing service. And Gmail, where I have several accounts. I can access my email on my iPhone using the iOS Mail app, and I can access most of them with OS X Mail as well. I keep the Yahoo! account for legacy reasons, but there’s no need to sync calendars or contacts with it. I use several free browsers. Google Chrome is my primary, followed by Safari, then antiquated Camino, which is a much better tool for copying text for use elsewhere than anything else I have. I also have Firefox and sometimes use Opera as well. 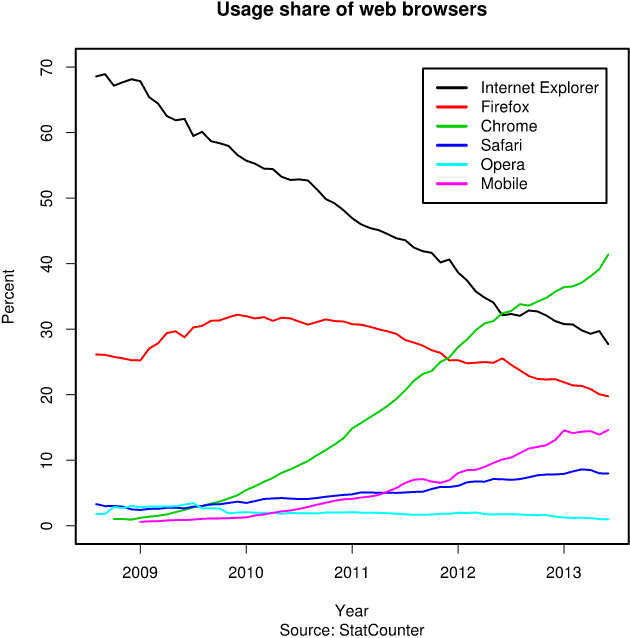 On iOS, it’s mostly Safari, followed by Dolphin and Chrome. Thanks to Apple’s generosity, I’m also using free OS X Mavericks on my MacBook and free iOS 6 and 7 on my iPhones. I’m not sure that Google really is a better choice than iCloud for people who exclusively use OS X 10.7 and later, but with my legacy Macs and legacy operating systems, Google is the better choice for me. Which would you trust more with your information: Microsoft, Apple, or Google? I don’t really trust any of them, but since I moved over to Linux and android I have been primarily using Google services. They are are far from perfect, but at least they are platform agnostic (as you said). As far as how much I trust each company, I don’t. But, using these services for free there has to be some price of adminission, and that could be lack of privacy or a shady EULA. If I don’t like it, then I don’t have to use it, its that simple for me.